Italy is a true gem of the Mediterranean which continues to allure more and more tourists from every corner of the world. The country consists of 20 regions that keep lots of unique treasures and outstanding sights to explore. However, there’s still an open question under consideration remaining unsolved. Where is it better to go - Northern or Southern Italy? We have put together some key tips on how to determine which Italy journey you’re looking for, and in this first part of the guide we’ll introduce you to the Italian north. Starting off, based on feedback, it’s fair to say that those who have been to Italy at least once surely want to come back there once again. Offering so many things to discover, it’s really no surprise that Italy ranks first in the world’s most visited countries. Although Italy doesn’t have an official division of the north and south, both parts represent the country from completely different angles. In fact, the dialects of the peninsula are at times so polar that even local Italians can’t always understand each other properly. Generally, the conditional boundary lies somewhere south of Rome. Roughly said, most of Italy’s “classics”, including Venice, Milan, Florence, Cinque Terre, and the Leaning Tower of Pisa, are all located in the north (see Northern Italy map on the right), whereas the sunny gems such as Naples, the Amalfi Coast and Sicily, are in the south. Ideally, a perfect Italy itinerary combines a little of both and features several days in multiple destinations. Such a program can start, for instance, in Venice or Milan, and make its way down all the way to Naples or even Palermo. So depending on your preferences, we advise visiting more than one place per your Italy trip. But to begin with, let’s get a close look at the north. Is north Italia what you want for your getaway? Talking about this part of the country, we can note that it tends to be more industrial and developed, nevertheless, is home to more things to discover than you may imagine at first. Adopting the features of typical Western European countries, the north possesses strong historical and economic ties with neighboring states, lacks "southern exotic", but has many gems, as mentioned previously, for which thousands of travelers come to Italy each year. Plus the north boasts a number of famous cities without which your Northern Italy itinerary won’t be complete. Based on what you prefer to see in Northern Italy, we suggest spending your Italian vacation in one of the following top five destinations, or even better, to add on more than one of them to your travel plans. If you’re in for a wine tour with delicious cheese, trust us, there’s no better place in Italy (and Europe) than Tuscany. What can be more delightful and relaxing than spending a lovely time in a picturesque location sipping a glass of high-quality wine such as Brunello di Montalcino or Chianti with a piece of traditional cheese? The region has centuries-old traditions of cheese making and olive oil production so the offer won’t disappoint even the most selective gourmets. But Tuscany is not only about vast vineyards, globally recognized wines, and green hills. 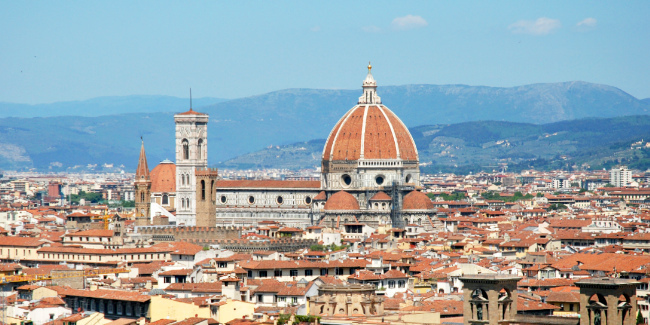 The capital of Tuscany, Florence, stuns visitors with its striking Renaissance architecture and world-class art. Plus, while in Pisa you’ll have the opportunity to take some pictures with the illustrious Leaning Tower or to explore the medieval heritage of Siena and Lucca. Fashionistas usually strive to go to Milan, which is known not only as a fashion capital, but also for its amazing cathedrals, art galleries and one of the most famous opera houses in the world, La Scala. What is more, travelers enrich their Italy holidays by planning to spend several days in the gorgeous crystal blue lakes, the most famous of which are Lakes Como and Garda, located about an hour away from Milan. These unique destinations, such as Desenzano del Garda and the city of Como, gift a one-of-a-kind experience with marvelous nature and a peaceful atmosphere. And it’s not only the lakes which you see when going to Como, these are the lands of gorgeous mountain views of the Dolomites and the Alps from petite colorful historical villas, standing on the shores of the lake. For a touch of romance, lovely Verona attracts Shakespeare admirers with Juliet's famous balcony. Juliet’s house is naturally on the program too! While exploring the city, stop by such Verona highlights as Piazza Bra and della Scala castle. When it comes to adorable Venice, the picture of great canals and cozy winding streets pops before the eyes. Venice is unlike any city on the planet, for instance, do you know another city in the world where the streets of over 100 small islands are replaced with canals and dozens of palaces and museums are concentrated on such a small territory? Practically any building you’ll get close by is a structure with a more than 300-year history. Moreover, if you plan your Italy travel and a visit to Venice in February, you’ll get a unique chance to immerse into the grandiose atmosphere of the annual Venice carnival with its mysterious masks and festive spirit. As for the highlights of Liguria, Genoa is, undoubtedly, one of the treasures of the region. Being the capital and the major port-city of Ligurian coast, the place attracts people by a number of hidden gems and amazing labyrinths of narrow tangled streets. Of course, the Cinque Terre towns cannot be left unmentioned. Have you ever dreamt about spending several days surrounded by the most dramatic coastal landscapes in the world? We bet, now you do. Fabulous Cinque Terre is a place that needs to be taken slow to enjoy the twisty streets of colorful towns and the postcard-like views of rugged cliffs framed by the blues of the Tyrrhenian Sea. To continue your Italian Riviera coastline journey, you may stop at Portofino. The place boasts a picturesque harbor and has historical ties with celebrity visitors so it’ll be a perfect addition to upscale your trip. Although set in the central part of Italy, we decided to include Rome to the north. Being the capital of the ancient empire and the country today, the Eternal City of Rome is a place full of inspiring art, overwhelming architecture and vibrant lifestyle. Apart from immersing yourself into the atmosphere of the Italian capital, witnessing such iconic sights as legendary Colosseum, the Trevi Fountain and the Spanish Steps, don’t miss a chance to visit the world’s smallest independent state Vatican. Tourists strive to this place in order to see the largest Christian basilica in the world, St. Peter’s Basilica as well as the Sistine Chapel. Of course, you can see the pictures of the iconic ceiling on the Internet whenever you desire, but isn’t it better to admire Michelangelo's mind-blowing frescoes with your own eyes at least once? To sum up, what we mentioned about Northern Italy is only the tip of the iceberg which can be explored, as we have not even covered such Northern Italy cities as Turin, Bologna, nor the independent state San Marino. And it goes without saying that the delicious cuisine of the Italian north is already a great reason to visit this region. But how about Southern Italy? In our next post we’ll introduce you to the sunny part of the country in our Italy travel guide Northern Italy vs Southern Italy | Part 2.